Fall, friends! It’s here, and I don’t know about you but I’m ready. Hello, excessive amounts of anything with pumpkin and apple pies. Hello, my favourite season. The term has once again started, and with it comes a sense of both excitement and dread. To be intellectually stimulated is one thing, but it’s important to not let the intimidation of new, bright faces obfuscate any goal, be it professional or personal. is full of the bioflavonoid rutin, which contains quercetin (also abundant in apples), and is thus of higher nutritional value than many other grains. Rutin helps with blood circulation and lowers cholesterol, to name just a few things. Makes it all a bit more exciting to put together. So you just whisk a few ingredients together, smack a quarter-cup of batter each time onto a hot pan, spread it out a little, flip to cook the other side for a short while, and there you have it– incredibly soft, tender crepes. The uniqueness of this dangerously delicious breakfast lies in its versatility– there’s a lightly toasted nutty flavour that can be combined with almost any flavour topping, although my personal favourite is coconut yoghurt and plenty of frozen but thawing summer berries on top. In a medium mixing bowl, mix together all the ingredients well. The batter should be pourable but not too wet, so if it seems too thick, add a tablespoon of milk, and if it seems too thin, add a little more flour. Heat your pan (add a little oil if it’s not a nonstick pan) on medium heat. Flick a splash of water on it to see if it sizzles, to check if the pan is hot enough to use. Once it is hot enough, add a quarter-cup of batter to the pan and use the back of the cup measurement to spread the batter out into a thin circle. Be careful here– you don’t want the batter to be too thin, as this will lead to easy breakage afterwards when you try and flip the crepe. Cook the first side until you see the edges of the crepe firm up, then slide your spatula carefully underneath and flip the crepe. Cook the second side for a little shorter, about a minute or so. Place the cooked crepe on a paper towel and roll it up before placing on a serving plate. Continue to do this for the remaining amount of batter. Serve with thick coconut yoghurt, tahini, berries and maple syrup! There’s nothing wrong with reverting to the classics. I’m a serious fan of innovation and weird mismatches that actually work (referring to my previous post here), but I was overcome by the staunch determination to conquer something truly ubiquitous, something most of us rely on the real professionals for. I’m only an amateur baker who does all this whizzing, whisking and whipping in the kitchen for pure fun, but knowledge of and experience with the classics is required for any further exploration, right? I’ve made brioche pretzels before, dived right in the deep end, no basic loaf or anything first, just a ‘ah-how-posh-and-fun’ kind of feel. Even added some chocolate chips and lemon zest to add to the childish fun. However, thanks to underestimation of the proofing and kneading time, I merely scraped by with a pseudo-brioche. Flat, dense, and just a little too hard on the bottom. The inside was fluffy, but the exterior betrayed a better could-be texture. Think I’ve got it this time, but the method I use here is adapted from something a little more unorthodox, whereby it’s all in the hand work, and the kneading time isn’t too horrid. I also used a little less yeast, because the first loaf I got using the original recipe was a tad too yeasty and the rise wasn’t as perfect as could be. Making this bread is actually fun, if you like to get down and dirty. It’s going to be sticky, wet and yellow, but that’s the magic of excess fat, eh? Rich, eggy, sublime. The crumb is light and tender, with the slightest stretch, though never feeling or tasting under proofed. The final result will look yellow. Easy to freeze, then microwave and cut for whatever you want really, be it toast, topped with good butter and honey or maple syrup, or dunked in freshly whipped eggs for a french toast morning. 78g unsalted butter at room temperature, cut into medium-sized chunks. 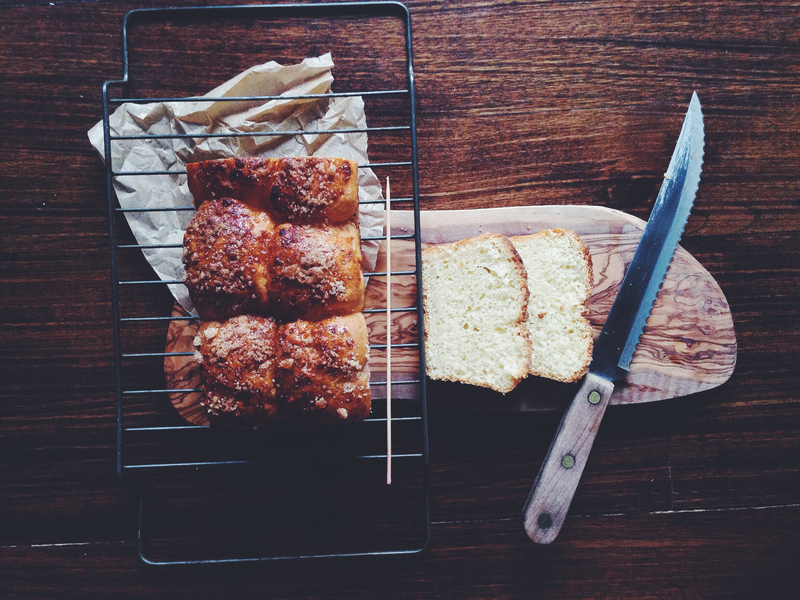 The day before you make the brioche or earlier in the day, make the maple pearl sugar. Mix the sugar and maple syrup in a bowl using your fingertips. It should be wet and clumpy. Tip the maple sugar on a plate and flatten using your fingers, about a half-inch thick. Cover the plate with cling wrap and leave in the fridge to set. After 4-6 hours, the sugar will have formed a malleable, solid layer, which can be broken up into smaller chunks, similar to that of pearl sugar. Yum yum. Leave it in the fridge before using. Now for the brioche. Use a mixer if you wish, but I used my hands for everything. In a large bowl, whisk together the flour, sugar, salt and yeast. Make a little well in the centre and, with your hands or a wooden spoon, mix in the warm milk briefly. Work in the butter (I find it easier to use your hands for this part) chunk by chunk, making sure each chunk is mostly incorporated before adding the next. It will be sticky and oily, but don’t fret. Add in the eggs one by one. Stir the first egg in with a wooden spoon, then use your hands to really work it in. It will look messy and clumpy at first, but keep trying to incorporate the dough and egg together. I ended up working the dough when it was suspended in the air, stretching it then folding it over itself again, like kneading in mid-air. It worked, and I saved myself a lot of clean-up hassle later on. Do the same for the second egg. It will be very sticky, difficult and incredibly wet. That’s exactly what you want. Once the eggs are worked in, dump the soft, yellow mass of dough into the same bowl and continue to ‘knead’ with a wooden spoon. Beat it with your wooden spoon, mimicking the kneading action in the bowl. Knead for a good 5-7 minutes. The dough will look like a pale baby’s bottom, smooth, taut, flawless, but still very sticky. After kneading, leave the dough in bowl (it’s already greased enough), cover and let the dough rise for an hour. After an hour, put the dough in the fridge and leave for another 2 hours, or overnight. After the couple of hours, take the dough out of the fridge and the bowl. Preheat your oven to 190C and grease a 9×5-inch loaf tin. Punch the dough down a little, then weigh the dough and divide it into 6 equal pieces. My dough weighed around 450g total, so each piece was 75g. The cold dough is a dream to touch and work with. Roll each piece into a ball and pop into the greased loaf pan. After rolling all the pieces into balls of the same size, you should get a 2×3 row of balls in the loaf pan. Beat an egg and brush the top of the loaf with the egg wash. 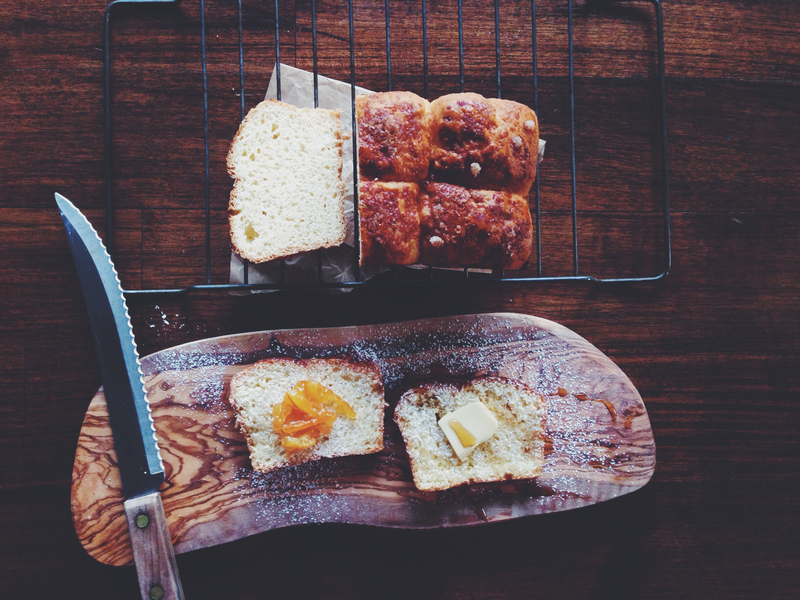 Finally, take the maple pearl sugar and sprinkle it on top of the loaf. You will get pea-sized chunks as well as normal sprinkles. Bake the loaf for 30-35 minutes. If you wish, take a piece of aluminium foil and cover the top of the loaf after 15 minutes to prevent over-browning. I used the middle mark and stopped the baking after 33 minutes, and it turned out perfectly. This loaf can be put in a freeze-safe container and left in the freezer for a couple of months. It can be left at room temperature for 1-2 days and nothing more (especially in this bloody hot weather). Whenever you want a nice, slightly sweet treat, just take the loaf out, microwave on high for 20 seconds, cut with a bread knife, then toast or dunk in egg for… Well, does french toast need any explanation anyway?